This LibGuide takes 5th grade students through the human behavior and historical events that precipitated WWII. It is based on the first 3 steps of the Facing History & Ourselves process and is designed to be used as a supplement to classroom discussion. Home: What Led to WWII? because it's cheaper than wood. it's cheaper than buying wallpaper. By the fall of 1923, workers were paid twice a day. After each pay they were given time off to go shopping, so that prices wouldn't rise any further. At the height of hyperinflation, just buying the day's food could cost trillions of German marks; people had to shop with backpacks and wheelbarrows to be able to carry their money -- and many people who had been managing just fine found themselves starving. That's not surprising, considering that a loaf of bread, which had cost about half a mark in 1918 sold for over 200 million marks by the autumn of 1923. You can see some other Weimar prices on John D. Clare's website (scroll down to the subheading "Effects"). This chart from Facing History compares the German mark to the U.S. dollar from 1919-1923. Use the weblinks above to help you answer these questions. 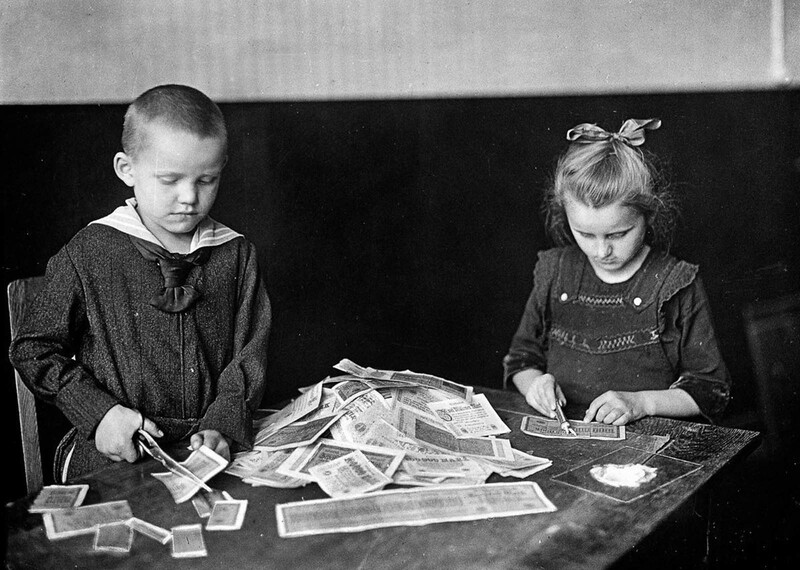 If you were in a restaurant in Weimar Germany in 1919 and you had 1 American dollar, what would you be able to buy to eat? 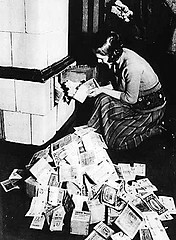 If you were in a restaurant in Weimar Germany in 1923 and you had 1 American dollar, what would you be able to buy to eat? If you were a German citizen in the Weimar Republic, how do you think you would respond to the crisis? What would you do? What would you say? Who would you blame? 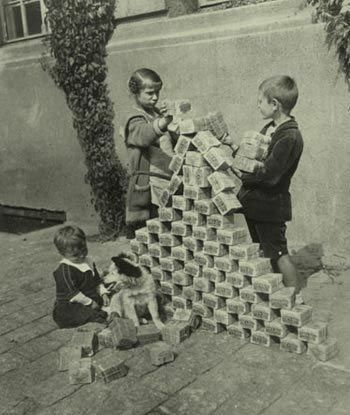 Children use bundles of money as building blocks. ​Children cut German marks to create crafts. Buying vegetables with baskets full of money. The really fashion-forward create Deutsch Mark dresses. "In times of trouble, people often look for easy answers. Their fears and suspicions of those they regard as the other also increase." The people of Germany were understandably angry about the state of their economy. They staged protests and some of them participated in violent riots. If you had been on the train with Mr. Buxbaum, do you think you would have said or done anything? Have you or someone you know ever had a similar experience? How did you feel? How did you respond? In times of economic upheaval, political unrest, or social stress, people often feel powerless and angry. How could a leader turn those feelings against “outsiders” or “strangers”? What might be the result of such action? How might economic crises encourage people to place their faith in leaders who offer simple solutions to complex problems?